Happy Sunday. I woke up with a start this morning thinking it was Monday and I was running late. Then remembered it’s Sunday and laid back down for a few extra minutes of relax before getting up for a 7.4 mile run, then church, then errands to run and whew, I’m ready to relax now! Even though the temps are still stinking hot here in the 90s, it’s starting to look like fall in our garden, I have three of these cute pumpkins that started growing from seeds in our compost in June and ripened early with more starting on the vines. 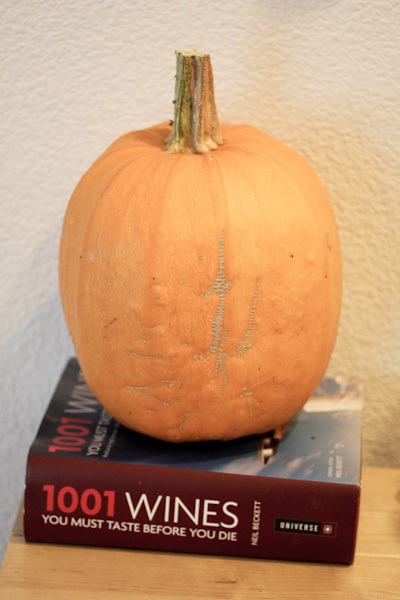 I’m also getting early winter squashes from our garden that the seeds survived the compost bin – acorn, butternut, and this unique squash. What is it? 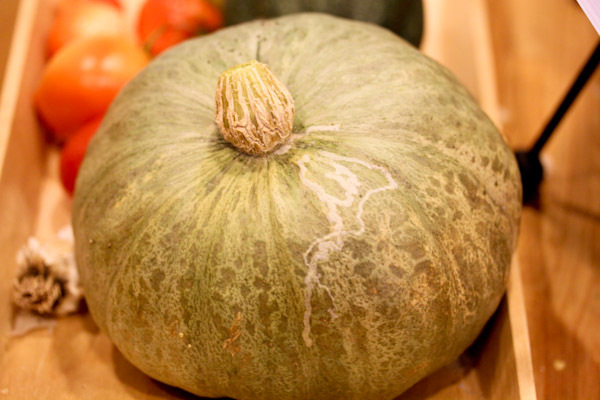 At first I though maybe a variety of kabocha since plenty of those seeds ended up in our compost, but the skin is too light. Maybe a mutant of some sort? Lunch was an interesting combo yesterday since I’m still in money saving mode. I’ve been doing minimal amounts of grocery shopping while trying to use up dried beans and grains in the pantry and whatever I can pull from the garden. It’s actually been fun, some of the combos have been better than expected, our pantry feels very under control now, and we’re creating better habits for saving money and being resourceful in the future. But yesterday I didn’t have much to work with – a lonely jicama, small chunk of ginger, and a containers of nuts and seeds in the pantry. 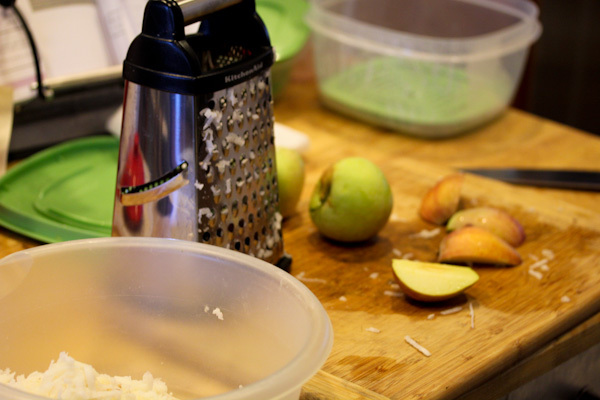 I broke out the cheese grater tower and shredded the jicama and a couple of apples from our apple tree for a unique salad base. 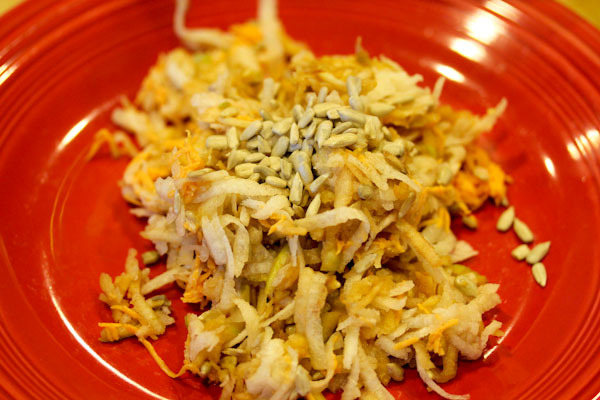 Then I added grated ginger, sunflower seeds, a sprinkle of cinnamon, and tossed it with a tablespoon of apple cider vinegar. The result was actually pretty tasty, a cool and crisp summer salad with hints of fall. 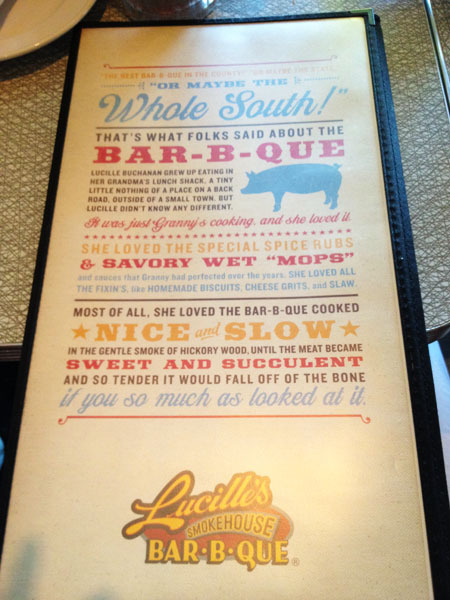 For dinner I went somewhere not many vegans would venture too – Lucille’s BBQ. Trust me, I didn’t go for the food, but for the company. Hubby and I met my sister, brother-in-law, nephew, and friends. I had to do some Googling before to know what to order, the vegan selections on the menu were pretty weak. 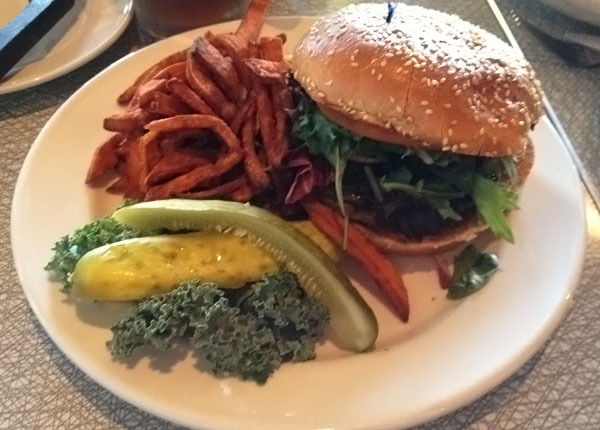 I ended up with a garden burger with a vegan veggie patty and holding the mayo and cheese and sweet potato fries. I’ll give them credit, there were a lot of fresh greens in the veggies burger for a BBQ place. 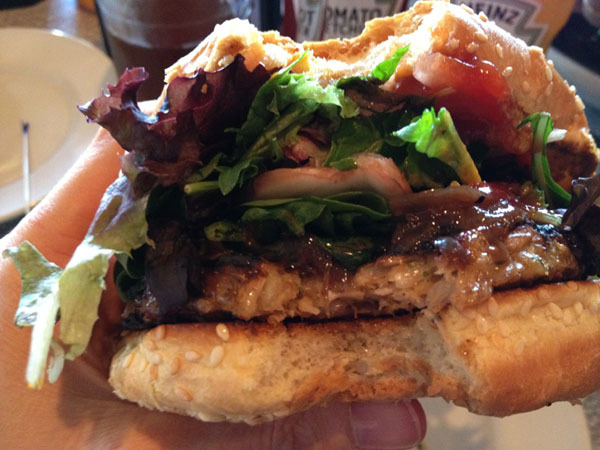 And the veggie patty held together nicely with visible grains and veggie chunks in it. What was a bummer was that most sides and salads were not vegan friendly at all and there wouldn’t be much left of the salad left after removing the animal products from them as most contained more cheese, eggs, bacon, and other types of meat than veggies. And even the sweet potato fries, greens, corn on the cob, biscuits, and other sides contained animal products, which kept me out of trouble I guess. :-) I was happy with the burger considering, it was very filling and considerably cheaper than the monstrous rib platters everyone else at the table was eating. And I was impressed that the service had no problem with me customizing the order and even brought me extra mustard and ketchup. 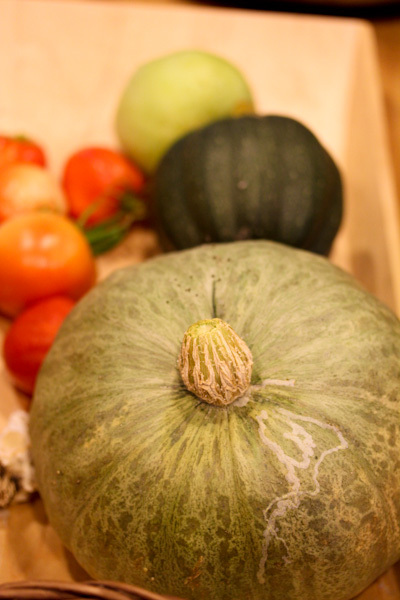 gosh i love your varieties of squash! also love that you are running and cleaning out the pantry. we love to do that too and i agree it makes you be more creative with your meals. love your burger out! you inspire me to eat vegan at restaurants!